QALS is the administration service responsible for the provision of definitive prosthetic services to eligible residents of Queensland through the Queensland Government’s ‘Artificial Limb Scheme’. Australian important and in-demand amputee support organisation. Provides information and support to amputees and their families throughout the country. 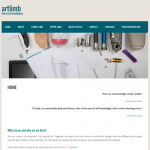 ArtLimb is an online resource about modern prosthetics written for amputees, their families and support networks. ArtLimb’s mission is to empower amputees with an greater understanding of prosthetics, helping them reach their best possible outcome in prosthetic treatment. Very Good Knee (VGK) is a family of adaptive fluidic knee joints using microkinetic processor technology, unlike the battery dependent microprocessor controlled and basic hydraulic knees. The Osseointegration Group of Australia provides a team approach to assist amputees with the possibility of greater and more effortless mobility using the newest innovation in the field of prosthetics, the OGAP-OPL. Empower Golf’s mission is to facilitate and promote golf for Australians of all abilities to participate and/or compete. Amputees & Families Support Group Qld Inc.
Amputees & Families Support Group Qld Inc is dedicated to empowering amputees to move towards reaching their maximum potential by providing practical information and support.